Welcome to my first blog dedicated to my quaint lifestyle. So what do I mean by “quaint”? Lets take a look at the definitions, according to Google. Right on! That’s me to a “Tee”! But there is more to Quaint Homesteading than nostalgia, it has to do with the “Transitional Communities Movement” and the belief, that one way or another, there will be an “Energy Decline”. Living in a more sustainable way and decreasing our dependency on electricity will help us survive this decline in cheap affordable energy. Some projects are very high tech, like solar panels, but others, like putting up a clothes line are low tech, hence the emphasis on “Quaint”. A big part of the Transitional Movement is creating local economies, starting with food, which is also an area my blog will cover. So if you like cooking from scratch, organic gardening, Community Supported Agriculture, raising back yard chickens for eggs and meat, slow foods, and crafts, like crocheting, you will find something to read here! I’m also an Earth Centered Spiritual Liberal and member of my local Unitarian Universalist congregation, so I’ll be posting about my faith and how I celebrate the divine. On occasion I even write poetry! Other topics will also include writing about my battle with CHAOS (Can’t Have Anyone Over Syndrome) as I’m an organizationally challenged housewife. So, if any of these topics interest you, please add me to your favorite blog reader (I like google reader) and let me know what you enjoy hearing about the most. I’m here to please the audience! About three months ago I started practicing yoga on a regular basis. Naturaly I didn’t want to spend any extra money on classes, nore do I have the time to take a class out of the home, but a friend pointed out to me that on the PBS2 channel there are several yoga programs that come on early in the morning. I’ve been looking to start some kind of regular physical practice so I thought I’d try it, and I’ve become a big fan of “Priscilla’s Yoga Stretches”. Her programs are easy to follow and she’s very keen on not hurting yourself and not being intimidated. Her Yoga program is like the “Slow Foods” movement’s version of exercise! I’ve also found on Netflix Instant Play several yoga programs for specific topics, like relaxation, aches and pains, strength and flexability. You can also find yoga DVDs at the library. I really enjoy it because it feels good, physicaly and spiritualy. If you have alot of muscular aches and pains, you can also use yoga to reduce your dependency on pain medicine. Why reach for the advill when you can use a few positions to loosen up your muscles all by your self? After all, reducing health care costs begins at home, right? I look forward to yoga every morning and I hope to can keep with it. When I’m as old as Pricilla, I want to look as good and feel as good as she does! 1)Fill your biggest stock pot half way with apples. (Peal and core them if you don’t have a foley food mill.) Fill the stock pot the rest of the way up with any other fruit you like. If you use all apples, you will have to add apple juice to it so that it doesn’t burn, apples just don’t have enough moisture. Give it a good stir and keep an eye on the temperature. It should only take 20 minutes or so to get soft. Mash it with a potato masher a little. 2) If you didn’t peal the apples or if there are any other large seeds you want to remove, set up your foley food mill over the crockpot. Mill all the fruit, set your crock pot on low with the lid off. Cook for 8-12 hours. Feed all the peals and seeds to the chickens, or compost pile. 3)Taste your fuit/apple butter. Add sweetner to taste. Add cinnimon to taste. Honey is excellent in this recipe! I also like “Apple Pie Spice Mix” and “Pumpkin Pie Spice Mix”. 4) Set your oven to warm/120 degrees. Wrap your cookie sheets with plastic wrap. Wax paper will not work!! Spoon some fuit butter on the plastic wrap, and spread out so it’s no more than 1/4 in thick. Place it in the oven with the door open a little, so moisture will excape. Every few hours rotate the trays, if you have more than one. Cook about 8-12 hours, until the fuit is dry and leathery. 5) Peal the fruit from the plastic and set it on a cookie rack to dry on the counter. When it’s fully dry, powder it with corn starch. Roll it up or slice it into bite sized pieces and store in a zip lock bag in a dry cool place. You can “cheat” by starting with store bought apple sause and start directly in the crockpot with any other fruit you want. You might want to run the whole fruits through a blender if you want a smooth consistency. And please, if you do buy store applesause, get no sugar added! The whole point is to avoid high fructose corn syrup. If you want to cut costs, plant your own apple tree and berry bushes. Or buy fruit “seconds” at a farmer’s market. “Seconds” are the fruits that are over ripe, or just blemished. Sometimes you can get the seconds for free! I made my first batch with free second plums that I dropped in a bag and froze to make the fruit butter/leather several weeks later. So we did two hatches this spring, one with 8 our of 34 survived (not good at all). And then the second batch 14 out of 32 survived and are doing great. I sold a few from the first batch but kept the three mixed breed chicks, so all together I have 17. Some are mostly black, some are brown with stripes, and some are more blond with stripes. I have no idea if any are pure or not. I did read that when you cross a Plymouth Rock hen with a Speckled Sussex Rooster, male chicks will be black with a blond spot on his head, and the hens will be all black. So I have at least three black hens, and one black rooster, who we plan on eating. We are going to butcher the roos in the fall, unless we get a SS roo, which we might keep. All the chicks are in the brooder coop with a lamp that comes on in the evening and goes off during the day. Gotta keep the costs down! 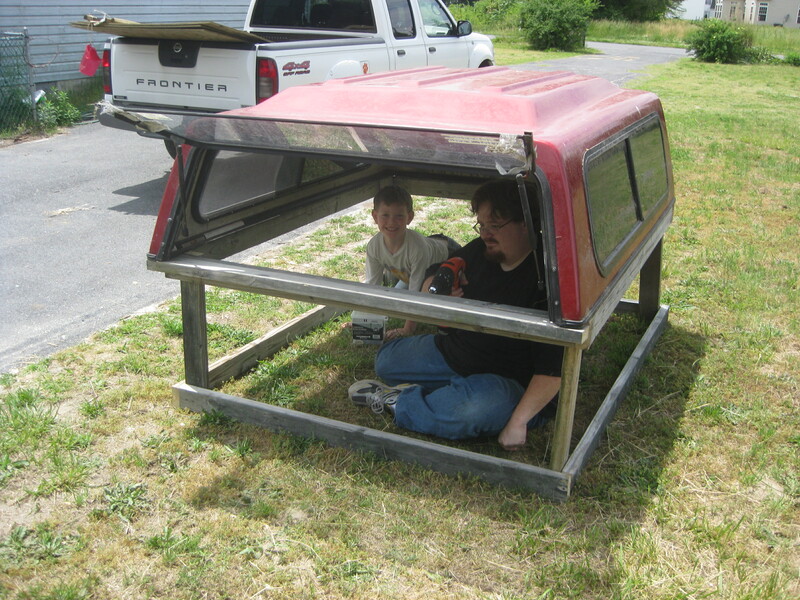 We finished the Truck Cap Chicken Tractor, but not the run. We are housing our SS roo “Lucky”, two leghorn hens, and two young roos that were given to us in it. One leghorn we are treating for “bumblefoot” (abscess on the foot) and the other has severe feather loss. We call her “Franken-Chicken” and her feathers are growing back in. They are both doing much better in the new coop. The two young roos are happier in there too, because in the layer coop they were getting picked on by “Little Roo” the RIR rooster. Lucky and Little Roo, who isn’t so little anymore, started fighting so I had to seperate them. They are getting used to sitting on the roosts while we push the CT to a new spot of grass every morning. The milk crate nest boxes are working out well, and Vincent can open the sliding window to reach in and get the eggs. Next year we will set up Luck and our one and only SS hen to try to get some pure SS chicks. We plan on building a detachable run for the coop, but have gotten rather busy, not to mention hot out! Blessed Summer Solstice to you all! 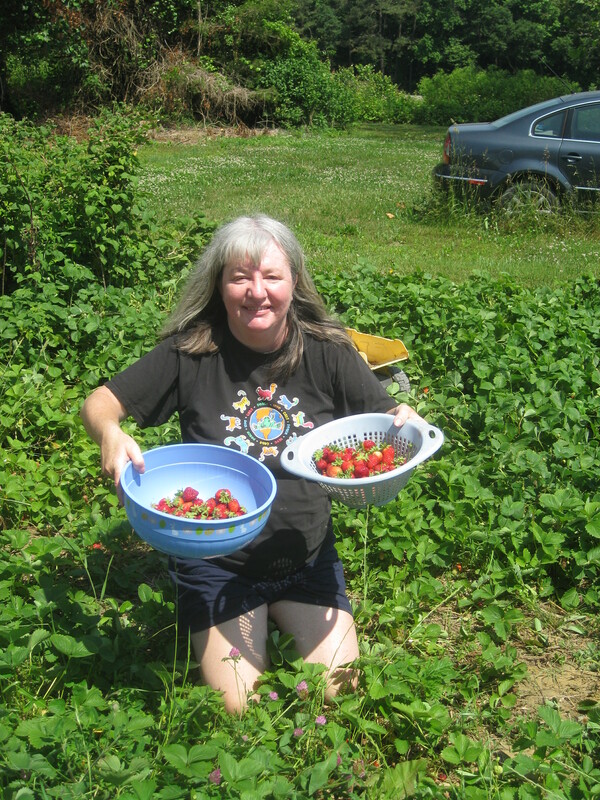 A few weeks back, a friend invited Julian and I over to pick strawberries which set off my new obsession with pies. 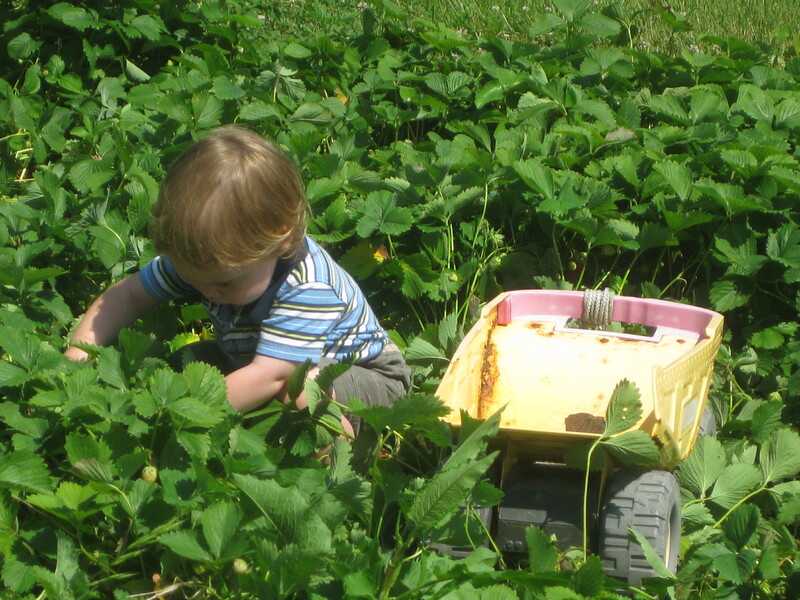 We had a great visit, picked some strawberries, ate some delicious muffins, and let JJ skinny dip in the kiddie pool. I plan on inviting her to my homestead when the blackberries are ripe to return the favor. So that weekend I bought some Rhubarb from Sharon’s Natural Garden and made a Strawberry-Rhubarb pie, and a Strawbery Poke Cake. I also discovered that you can make whip cream with a hand crank egg beater. My pie went over very well Memorial Day weekend which we celebrated with friends at a Firefly Marathon (the TV show). Last weekend Sharon’s Cherries were ripe and I bought two quarts of sour pie cherries from her and made my first cherry pie. I don’t normally like cherry pie, at least not the stuff you get at a dinner that probably came out of a can. But I LOVE fresh cherry pie! We have two dwarf pie cherry trees planted that we will one day make our own pies from! Currently at the homestead, the raspberries are ripening! I have this great raspberry salad dressing recipe that I think is too good to share! I’ve picked and frozen several pints, and hope to make some ice cream from them this weekend. I also purchased a black raspberry plant from Sharon! My mother’s favorite ice cream is black raspberry, which is not at all like red raspberries or blackberries. When I was a kid, we use to stop at Richmond’s Dairy near Woodstown, NJ just for the black raspberry ice cream on the way to and from grandma’s house. Anyway, black raspberries are hard to find in the store, so I’m delighted to add them to my homestead. They produce small berries in the spring a little earlier than the red ones. Sharon might still have some frozen, if you are looking for them! So, with all this pie making, I was thinking how fun it would be to have a “in season” pie business, where I grew as much of the fillings myself. Currently we have raspberries, a few blueberries, lots of blackberries and apples. I also have all the eggs I could ever want! In the future we will have cherries, plums, more apples, peaches, and pears. If we add to that sweet potatoes, and pumpkins, strawberries and rhubarb we could make pies from May to November. And I could bake them or freeze them to be baked at home. The question is, where would I sell them? Lots of families, in a pinch buy rotisserie chickens from the store already cooked, and it is a much better option than fast food, but you can roast your own chickens at home very simply if you plan ahead. First you have to have a roasting pan with a lid, so that you can easily roast two chickens at one time (one inside the lid), which saves time and energy. (Two birds with one stove, I mean stone! LOL) You will also need about 5 minutes to prepare the chicken, and about 1 hour and 10 minutes to cook the chicken. If your chicken is frozen (keep two in the extra freezer in case you have friends over) you will need to take them out of the freezer and leave it on the counter in a pan (or in a cold oven in case you have pets ) the night before (and the entire next day) you plan to cook it. (Yes, I know this isn’t how we should thaw out chicken, but it does work. Instruct the first person to get home to cook them, or at least put them back in the fridge if they are totally thawed.) You will also need cooking spray, salt and pepper, and an empty sink. Unwrap and rinse your birds, most chickens don’t have any organ meat packed inside, like a turkey does. Put your birds in the pan breast up, spray with cooking spray (faster than applying butter) and put a dash of salt and pepper over the top to taste. Optional: some like to put a pealed whole onion inside the bird, but it’s not required. Put your birds in the center most rack on the oven, and cook for 30 minutes. Then turn the heat to 375 for 40 minutes. When it’s done, cut into the space between the thigh and body and if the juices aren’t pink, it’s done. Now you have 1 hour and ten minutes to work on side dishes! I mashed potatoes and gravy with a salad are a favorite in my family! Why is this a frugal recipe? For one, whole chickens are the cheapest way to buy chicken. Locally I can get whole birds for $0.88 a lb. Two, you are cooking two at once, so you spend less money on electricity or gas. You can use one roaster to cook two birds, so that saves money too. And you have lots of left overs! Don’t for get to pop the carcass in the freezer to make chicken stock at a later date! 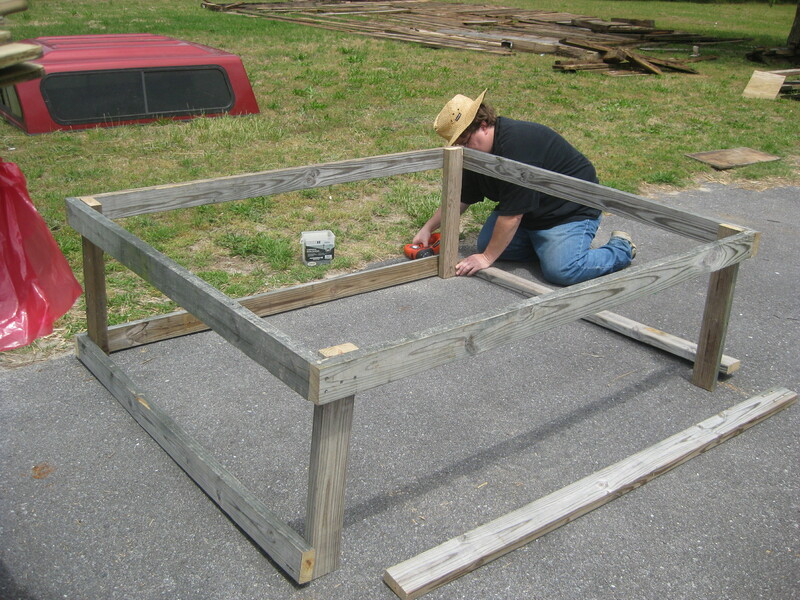 Paul putting together the base, which we made from salvaged wood from our deck we just tore down. The cap, which we got for free from FreeCycle, fits on top of the wooden base. Here are the roosts on the inside of the cap. The nest boxes will be in the back under that window, so we can reach in to get the eggs. 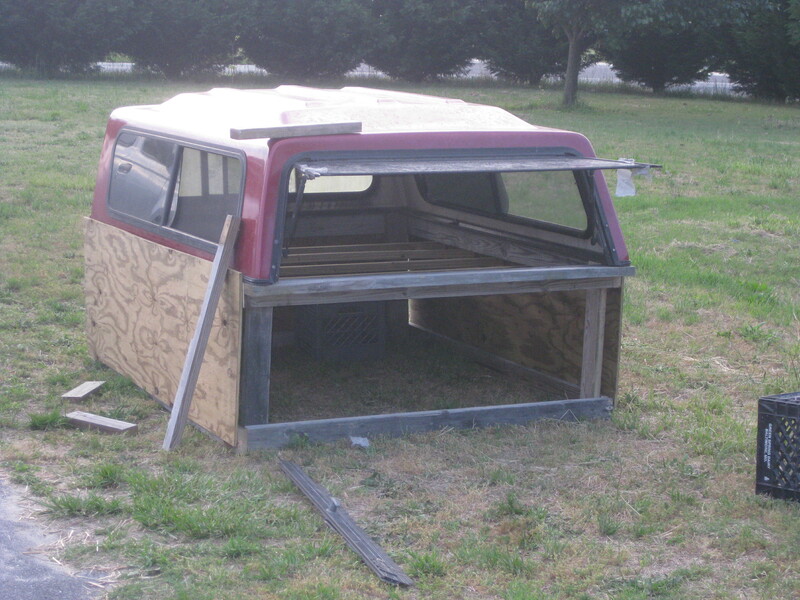 We have the plywood around the sides, but we aren't sure how we want to build the door in the front. We plan to put four wheels on the base so we can move it, because the cap is kinda heavy. For nest boxes, I thought some milk crates that we picked up on freecycle would work, mounted under that rear window. Does anyone have any objections to that idea? Also we aren’t sure how we want to build the chicken door in the front panel. I would like to have a horizontal door that folds down to make a little exit ramp, but I’d also like to be able to shut and lock it from out side the run, which we haven’t built yet. 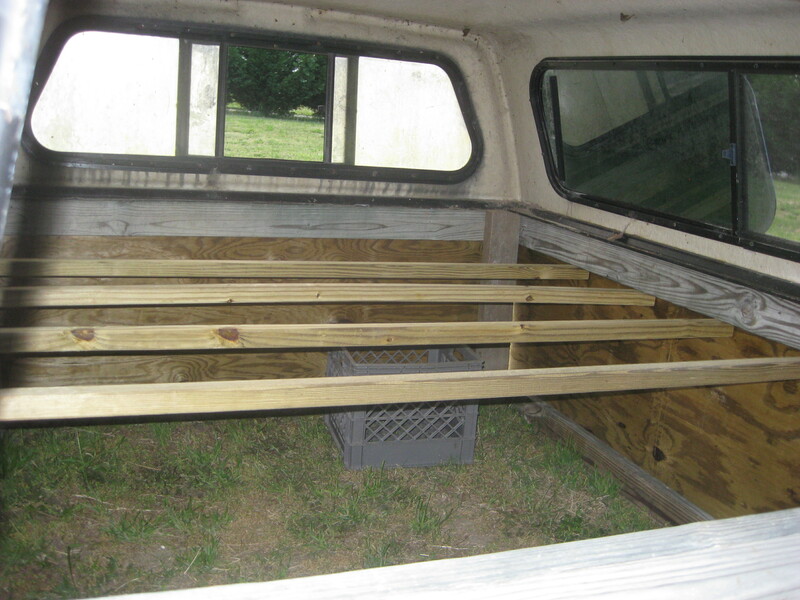 Run is going to be detachable with small wheels, and slip over the end of the coop with the window. To facilitate feeding, watering, and moving, the idea is to lock the chicken in the cap at night and then in the morning, detach the run, move the cap to a new spot of pasture, open the cap window and refill the water and feeder, close the window, and then re-attach the run, and then open the horizontal chicken door to give them access to the run. I’d like to have the cap coop to be predator proof enough to be usable without the run, if I need to isolate a bird, or raise some young birds separate from the rest of the flock. Any feed back, comments, questions, advice or suggestions are welcome!